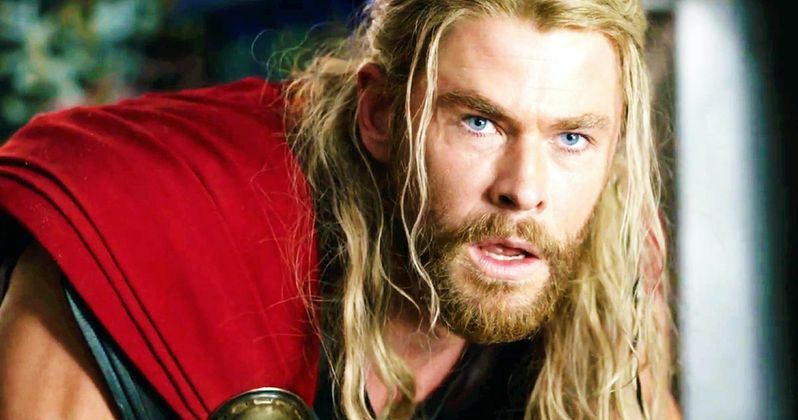 Fans can see the mighty Asgardian Thor (Chris Hemsworth) sporting a new short-hair look in this weekend's Thor: Ragnarok, but new photos from the Atlanta set of Avengers 4 confirm that Thor has grown out his hair once again. The actor was seen on the set alongside Robert Downey Jr., who is wearing a t-shirt some fans might recognize that may indicate the production is filming a flashback scene of some sort, although it could also just be a very large coincidence. There are also some intriguing shots of Loki (Tom Hiddleston), who is seen being restrained in a manner similar to Hannibal Lecter. The photos were taken yesterday on the Atlanta set, with Chris Hemsworth seen chatting alongside Robert Downey Jr., who some fans have already noticed is wearing the same Black Sabbath t-shirt from an iconic scene in 2012's The Avengers, where Tony Stark confronts Loki, who is waiting in Avengers Tower for him. It's this scene where he delivers his now-iconic line, "We have a Hulk," and while there is no indication as to why Tony Stark is wearing this shirt again, it's possible that this could be a flashback scene, since Thor has long hair again and the armor he's wearing is quite similar, if not identical, to his armor from The Avengers. Since there is practically nothing known about the story at this point, it remains unclear why this Black Sabbath shirt has surfaced, along with Thor's lustrous locks. Speaking of Loki, the God of Mischief is seen being restrained with some sort of device over his mouth. It's possible that this scene is set at some sort of S.H.I.E.L.D. facility, since there are other photos that show Robert Downey Jr. wearing a tactical, S.W.A.T.-type of outfit, where the S.H.I.E.L.D. logo can be seen on his arm. Since S.H.I.E.L.D. has been legitimized once agains on the MCU TV series Agents of. S.H.I.E.L.D., it's not surprising that the agency is surfacing on the movie side again, but as for Loki, there had previously been reports that Thor: Ragnarok would be his last MCU movie, but, even if this is just a flashback scene, that doesn't appear to be the case. There was also a report last month that Avengers 4 could be the final Marvel movie for the Russo Brothers, who have directed Captain America: The Winter Soldier, Captain America: Civil War and Avengers: Infinity War. That has yet to be confirmed, but with the studio revealing very little about Marvel Phase 4 up until this point, it's possible that the studio could be eyeing a fresh crop of directors to take the reigns of this monstrous franchise. The studio has confirmed that Spider-Man: Homecoming 2, arriving just a few months after Avengers 4, will be the first Phase 4 movie in the summer of 2019, which will likely be followed by Guardians of the Galaxy 3 in 2020. Aside from the numerous set photos, there is also a lengthy video from the set, where you can get a brief glimpse of Thor and his long hair through the glass walls, but you get a much better glimpse of the Asgardian in these photos. Also for reference, we've included The Avengers scene in question which reveals Tony Stark wearing the same Black Sabbath t-shirt as seen in the photos taken on the Atlanta set of Avengers 4. Take a look at these photos, courtesy of Just Jared, below, as we wait for more on Avengers 4.